As part of beginning a new chapter of her life, Michelle was ready to find a new place to call home. When she saw Fallbrook at Riverwalk Vista in Riverside, California, she knew that the community was for her. One of her main priorities in a new home was its walkability. She found this and so much more in her new neighborhood. The two-story floor plan Michelle chose was just the right fit. She appreciated the privacy of the master suite and loved the covered patio and expansive kitchen island. She was pleased that she was able to incorporate the finishes she wanted into her new home. A contemporary feel was also very important to Michelle. To her, Richmond American homes felt a step above the others she had seen. Visiting the Home Gallery™ was a highlight for Michelle. She was able to take her time and select the granite countertops and cabinetry that caught her eye. Michelle also decided to take advantage of the opportunity to have her home, financing and insuring needs taken care of by Richmond American and its affiliates, American Home Insurance Agency, Inc. and HomeAmerican Mortgage Corporation. As someone who values quality in all areas of her life, Michelle said that buying the home was an automatic recommendation to her friends and family to do the same. 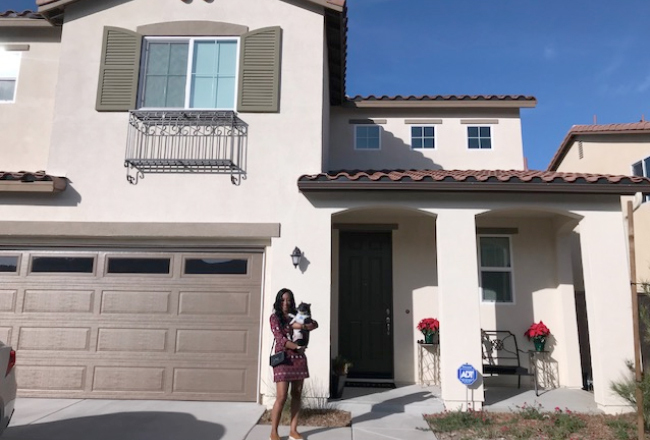 When asked to describe her homebuying experience in one word, Michelle said, “outstanding!” This is Michelle’s fourth brand-new home and the best building experience she’s had. We are excited to welcome Michelle to the Richmond American family! Are you interested in moving to Riverside County? 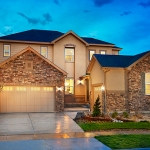 Check out our range of communities in the area.